Aine Davis is a British member of ISIS who previously belonged to the four-member ISIS cell known as “The Beatles.” Led by deceased ISIS executioner Mohammed Emwazi, a.k.a. 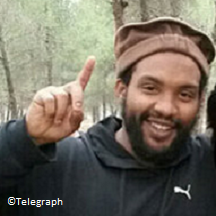 Jihadi John, The Beatles also included British citizens Alexanda Amon Cotey and El Shafee Elsheikh. The four were responsible for holding captive and beheading 27 hostages, including American journalists James Foley and Steven Sotloff, and American aid worker Peter Kassig.“State Department Terrorist Designation of Alexanda Amon Kotey,” U.S. Department of State, January 10, 2017, https://www.state.gov/r/pa/prs/ps/2017/01/266762.htm; Tom Whitehead and Harry Yorke, “Jihadi John's fourth Beatle unmasked as refugee given shelter in UK,” Telegraph (London), May 23, 2016, http://www.telegraph.co.uk/news/2016/05/23/jihadi-johns-fourth-beatle-unmasked-as-refugee-given-shelter-in/; “State Department Terrorist Designations of El Shafee Elsheikh, Anjem Choudary, Sami Bouras, Shane Dominic Crawford, and Mark John Taylor,” U.S. Department of State, March 30, 2017, https://www.state.gov/r/pa/prs/ps/2017/03/269306.htm. Davis is a convicted criminal, former gang member, drug dealer, and Muslim convert who left the United Kingdom in July 2013 and subsequently joined ISIS.“Who are Britain’s jihadists?,” BBC News, September 8, 2015, http://www.bbc.com/news/uk-32026985; Robert Mendick, “British jihadist at heart of terrorist network in Iraq and Syria,” Telegraph (London), August 16, 2014, http://www.telegraph.co.uk/news/uknews/terrorism-in-the-uk/11038871/British-jihadist-at-the-heart-of-terrorist-network-terror-in-Syria-and-Iraq.html; Dominic Casciani, “Woman jailed for funding Syria jihad,” BBC News, November 13, 2014, http://www.bbc.com/news/uk-30041625. Davis grew up in the west London borough of Hammersmith and spent time in prison for illegal gun possession. He reportedly converted to a “rather radical form of Islam” in prison, according to BBC security correspondent Frank Gardner.“‘Jihadi John’: Suspected accomplice arrested in Turkey,” BBC News, November 13, 2015, http://www.bbc.com/news/uk-34813534. In the early 2000s, Kotey, Davis, and Emwazi all reportedly attended the Al-Manaar mosque in Landbroke Grove, London.Jane Bradley, Tom Warren, and Richard Holmes, “ISIS Accomplice of ‘Jihadi John’ Named As ‘Quiet And Humble’ Londoner,” BuzzFeed News, February 8, 2016, https://www.buzzfeed.com/janebradley/unmasked-the-second-member-of-isiss-beatles-execution-cell?utm_term=.hblMB4XJj#.bx3DJ2X7r. The three were reportedly physically removed from the mosque because of their radical behavior.James Fielding, Sarah White, and Rod Ardehali, “‘The fact he's still alive will be a big relief’: Mother of ISIS Beatle suicide squad member is COMFORTED by his capture in Syria as his father admits: ‘We don't know what will happen to our son,’” Daily Mail (London), February 9, 2018, http://www.dailymail.co.uk/news/article-5372765/Mother-ISIS-Beatle-COMFORTED-capture.html#ixzz56vm9EInH. Davis is married to Amal el-Wahabi from northwest London. El-Wahabi tried to smuggle €20,000 ($22,600) to her husband via Turkey.“Who are Britain’s jihadists?” BBC News, September 8, 2015, http://www.bbc.com/news/uk-32026985. El-Wahabi was convicted of funding terrorism in August 2014 and jailed for two years and four months from November 2014.Dominic Casciani, “Woman jailed for funding Syria jihad,” BBC News, November 13, 2014, http://www.bbc.com/news/uk-30041625. El-Wahabi was the first person to be convicted in the United Kingdom of funding jihadists in Syria.Colin Freeman, “British associate of Jihadi John held in Turkey over plot to carry out copycat Paris attacks,” Telegraph (London), November 15, 2015, http://www.telegraph.co.uk/news/worldnews/islamic-state/11997530/British-associate-of-Jihadi-John-held-in-Turkey-over-plot-to-carry-out-copycat-Paris-attacks.html. At the trial, el-Wahabi said Davis was sent to Gambia at the age of 5 to live with his grandmother, returning to the United Kingdom twice at 8 and then as a teenager. In 2004, Davis spent two years at a young offenders’ institute for illegal possession of a firearm while in a taxi. Between 2002 and 2010, Davis was convicted six separate times for possession of cannabis. When he left the United Kingdom in July 2013, Davis abandoned four children by two different mothers.Robert Mendick, “British jihadist at heart of terrorist network in Iraq and Syria,” Telegraph (London), August 16, 2014, http://www.telegraph.co.uk/news/uknews/terrorism-in-the-uk/11038871/British-jihadist-at-the-heart-of-terrorist-network-terror-in-Syria-and-Iraq.html. In ISIS, Davis joined with Emwazi, Kotey, and Elsheikh to form the cell labeled The Beatles by hostages because of their British accents.Adam Goldman and Souad Mekhennet, “‘That is not the son I raised’: How a British citizen became one of the most notorious members of ISIS,” Washington Post, May 23, 2016, https://www.washingtonpost.com/world/national-security/that-is-not-the-son-i-raised-how-a-british-citizen-became-one-of-the-most-notorious-members-of-isis/2016/05/23/6d66276c-1cfd-11e6-b6e0-c53b7ef63b45_story.html?utm_term=.3125a25e6b63. According to freed ISIS hostages, The Beatles were among the more brutal of ISIS’s guards. Didier Francois—a French journalist held prisoner by The Beatles for 10 months—told CNN that The Beatles would regularly stage fake executions after telling captives they were to be beheaded.Mick Krever, “ISIS captors cared little about religion, says former hostage,” CNN, February 4, 2015, http://edition.cnn.com/2015/02/03/intl_world/amanpour-didier-francois/index.html?sr=fb020315isisquran4pVODtopVideo. Davis was among a group of suspects arrested in Turkey in November 2015 on suspicion of planning a terror attack in the country to coincide with the ISIS attack that month in Paris.Colin Freeman, “British associate of Jihadi John held in Turkey over plot to carry out copycat Paris attacks,” Telegraph (London), November 15, 2015, http://www.telegraph.co.uk/news/worldnews/islamic-state/11997530/British-associate-of-Jihadi-John-held-in-Turkey-over-plot-to-carry-out-copycat-Paris-attacks.html. A court in Silivri, Turkey, found Davis guilty of belonging to a terrorist organization. The court sentenced Davis to seven-and-a-half years in prison. Davis insisted on his innocence after his sentencing.Martin Chulov and Jamie Grierson, “British jihadi Aine Davis convicted in Turkey on terror charges,” Guardian (London), May 9, 2017, https://www.theguardian.com/world/2017/may/09/british-jihadist-aine-davis-convicted-in-turkey-on-terror-charges. Emwazi was killed in a November 2015 U.S. airstrike in Syria.Dana Ford and Steve Almasy, “ISIS confirms death of ‘Jihadi John,’” CNN, January 20, 2016, http://www.cnn.com/2016/01/19/middleeast/jihadi-john-dead/. Syrian Kurdish forces captured Kotey and Elsheikh in Syria in February 2018.Mark Hosenball and Idrees Ali, “Syrian Kurds capture two British Islamic State militants: U.S. officials,” Reuters, February 8, 2018, https://www.reuters.com/article/us-mideast-crisis-syria-britain/syrian-kurds-capture-two-british-islamic-state-militants-u-s-officials-idUSKBN1FS34Q. Aine Lesley DavisColin Freeman, “British associate of Jihadi John held in Turkey over plot to carry out copycat Paris attacks,” Telegraph (London), November 15, 2015, http://www.telegraph.co.uk/news/worldnews/islamic-state/11997530/British-associate-of-Jihadi-John-held-in-Turkey-over-plot-to-carry-out-copycat-Paris-attacks.html. HamzaDominic Casciani, “Woman jailed for funding Syria jihad,” BBC News, November 13, 2014, http://www.bbc.com/news/uk-30041625.